On tour one develops air-conditioning paranoia. 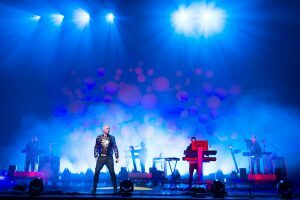 (I’ve just returned from a two-month Pet Shop Boys’ tour of North and South America, from Montreal to Lima.) You approach your latest hotel room with dread. How noisy is the air-conditioning? Can you turn it off? Is your room on the top floor directly under the main air-conditioning unit and therefore literally vibrating? When you check into your room during the day you often don’t notice the noise, but returning late after the show, the street noise having died down, you can become cruelly and sleeplessly aware of it. It’s time for the early-hours room change. The charmingly helpful hotel staff can never hear the noise but gently indulge you. Then there’s the freezing air-conditioning in dressing rooms. Are they trying to give you pneumonia before the concert starts? You learn to take something warm to wear backstage and always have ear-plugs by your bed. Is music the point of pop concerts today? Or is the taking of photos and videos on mobile phones where the enjoyment lies? Walking on stage, you’d easily assume the latter. At most concerts you’re dazzled by camera flashes and distracted by the glow of video-recording lights. In Atlantic City, I was trying to give a heartfelt performance of our ballad ‘Jealousy’, while directly in front of me a woman was getting a friend to take a photo of her standing in front of me, then checking the shot on the screen and, with much laughter, reshooting it. I felt like kicking her. I return home from touring to a pile of the various magazines I subscribe to, including this one. That David Cameron will soon be prime minister is now a given. No doubt a Tory government is on the horizon but I never meet anyone who shows the slightest enthusiasm for David Cameron (I haven’t seen Dylan Jones for quite a while). Not even Tory sympathisers. The consensus seems to be that he’s inevitable but that he’s a lightweight with no serious programme. In the past there was a fascination with, even a horror of, the emerging Thatcher and Blair. Cameron, however, seems to be regarded as depressingly unavoidable, the beneficiary of the weary failure of the New Labour project, arousing no strong feelings. I’ll be voting Lib Dem and wishing that Vince Cable was leader. I apologise in advance for bringing up a much-discussed subject but I’ve been away. ‘Under the carapace of glittering, hedonistic celebrity, the ooze of a very different and more dangerous lifestyle has seeped out for all to see’ creates such a surreal and ghastly image, almost Dali-esque, it would make an excellent title for a contemporary artwork. One reason for the outraged reaction to Jan Moir’s article about Stephen Gately is that it was written in such a powerfully creepy style. The reality is that after the break-up of Boyzone, Stephen was a hard-working show business survivor with a modest way of life. The carapace was a cheerful smile, the reality uncertainty and hard work. In my experience, it’s true of most performers. It might look a bit corny written down, but the Dame breathes into it a thrilling pathos and the authenticity of 50 years of show-business experience.